I have to admit… I’ve never been a big fan of schnaps. This clear brandy distilled from fermented fruits has a high alcohol content and the varieties I tasted in the past were simply mind-blowing, throat-burning strong with little flavour. That perception was radically altered after an extraordinary schnaps tour in Tirol, Austria! The production of schnaps is a long-standing tradition in the Tirol region. The fertile valleys and foothills of the Tiroler Alps are perfect for the cultivation of fruits such as apples, plums, peaches and apricots. This in turn has created a host of schnaps distilleries scattered across the region. When I first saw the description of the schnaps tour in my itinerary, I couldn’t help but laugh; I immediately had visions of myself stumbling from one distillery to the other and rolling down the grassy slopes in a drunken stupor. Haha! In preparation of the tour, I made sure I had a good meal! We stayed at the Hotel Tramser Hof in Landeck, a gorgeous hotel located at the edge of a small lake and surrounded by forests with the glistening peaks of the Alps as a backdrop. For lunch, I ordered a surf-and-turf salad with bread and it was absolutely perfect! The king prawns were surprisingly fresh while the steak was tender and juicy. 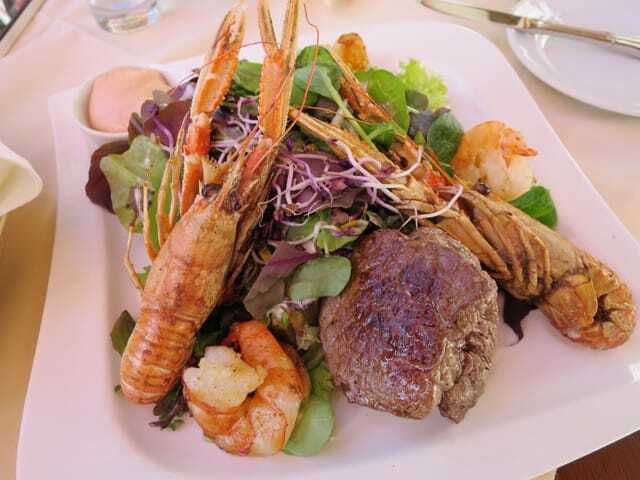 The fab surf & turf salad at Hotel Tramserhof. 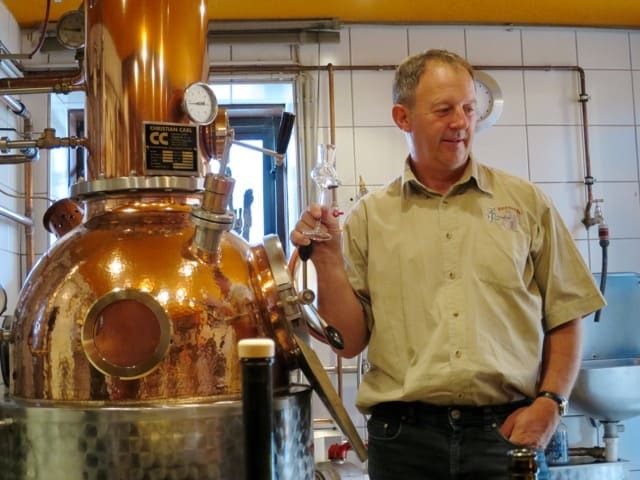 With a full stomach, we then made our way to the start of our schnaps tour, the Alfred Legenstein distillery in the village of Grins, about a 20-minute drive from the hotel. Alfred Legenstein is a member of the Tiroler Edelbrand Sommeliers, an association of distillers/sommeliers who are committed to producing high-quality brandies and spirits. This was my first introduction to a top-notch schnaps and I was bowled over by the passion with which Mr. Legenstein painstakingly produces his schnaps. The Signum (a joint production by members of the association), with its heady apple notes, is especially striking. Inside the Alfred Legenstein distillery. Needless to say, we left the distillery in great spirits (excuse the pun!). Led by Stefan Nothdurfter, a gregarious character who runs his own distillery in the neighbouring village of Stanz, we proceeded with a gorgeous walk to Stanz along the old Roman road (Grins boasts remains of an ancient Roman settlement) and past fruit orchards. The Alps towering behind the church in Grins. 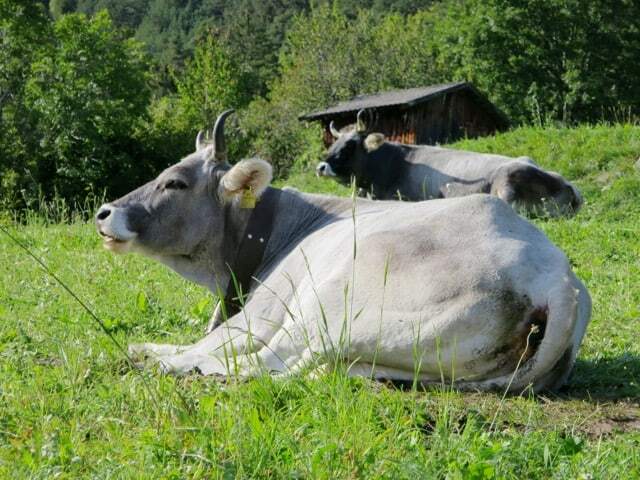 Cows resting in a meadow in Grins, and enjoying the views no doubt! The road came to an end and we continued through the forested foothills of the Tiroler Alps. Along the way, we were treated to stunning vistas of verdant meadows, the valley below and the imposing snow-capped mountains in the distance. 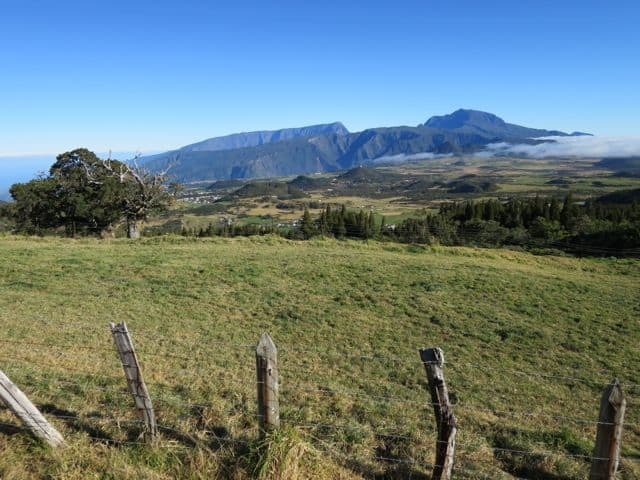 …and were treated to stunning views of the valley below and the mountains in the distance. The town in this photo is Landeck. We arrived in Stanz 1.5 hours later and found our next stop: the schnaps distillery of the Schimpfössl family. We squeezed into the little tasting lounge while Josef Schimpfössl introduced us to his range of schnaps. His family joined in the merriment and we had a great time sipping his schnaps and chatting with his family about travel and our blogging activities. Josef Schimpfössl introduces his schnaps to us. Our next distillery was Giggus, just across the road and owned by our guide Stefan Nothdurfter. Stefan was visibly proud and excited as he led us into his cozy tasting room. Inside the Giggus tasting room. His wife and daughter popped in with freshly-baked bread, a huge slab of butter and meter-long planks of cheese and bacon from their farm. It was an unbelievable sight! The delicious freshly-baked bread with cherry tomatoes and pickles. 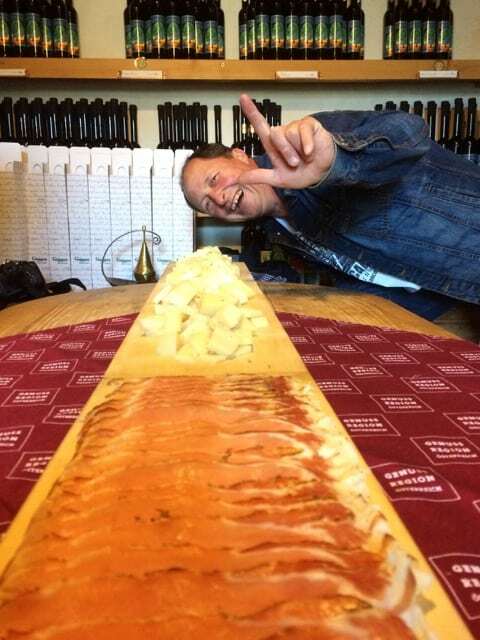 Stefan posing behind a meter of cheese and a meter of bacon! Stefan then invited us to dig into this specially-prepared ‘Tiroler Marend’, a meal consisting of bread, cheeses and cold cuts. Stefan cut a thick chunk of butter and spread it onto a slice of bread and covered that with a slice of bacon. He laughed as he saw our reactions to this fatty spread! “Fat is good if it’s cold”, he said with a big smile and a wink. We were all soon smiling too because the bread, butter and bacon were absolutely sinful and sublime! Bread, butter and bacon at Giggus – sinfully good! Stefan regaled us with his stories of life on the farm and his schnaps production. With a certain measure of pomp, Stefan introduced us to his award-winning schnaps. His zest for life and enthusiasm shone through in his schnaps which were strong, aromatic and silky smooth. This schnaps tour was such a wonderful way to meet the locals and experience their home-made food and drink! 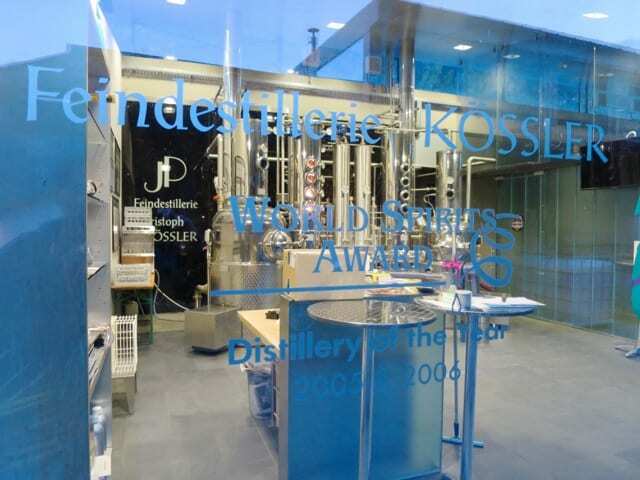 After a great deal of laughter and a good fill of bacon and butter, we said our goodbyes to the Nothdurfters and made our way to our final stop: the Christoph Kössler distillery, one of Austria’s best. The Kössler distillery was certainly more distinct, with its large and shiny production area. After a quick tour of the distillery, Christoph, a tall, brooding man, led us to his gorgeous, typical Tirol home next door. Our final tasting was just as special as the others. It’s always a treat to listen to someone who is so passionate about his craft. We sat, took small sips of his various award-winning schnaps and marvelled at his wondrous stories of how he creates the perfect distillation. Tasting schnaps with Christoph Kössler. It was a terrific tour and we returned to our hotel slightly tipsy 😉 but very excited after this extraordinary afternoon with the local distillers. Should you wish to do this Tiroler Schnapps Tour in Grins and Stanz, please inquire at the Tourist Office in Landeck. For a visual impression of this tour and other highlights of my trip to Austria, check out the video below, filmed by the talented Joshua Morin. Austrian Time from StoryTravelers on Vimeo. Note: my trip to Tirol was part of the #AustrianTime blog trip, a collaboration between the Austria National Tourism Board and iambassador. As always, all views expressed above are mine, and mine only. Nice place with a nice drink ! It’s absolutely breathtaking! Great combi of food, nature ad adventure! Amazing these pictures makes me so hungry! Ah, Austria – it grows on me each time I go back. 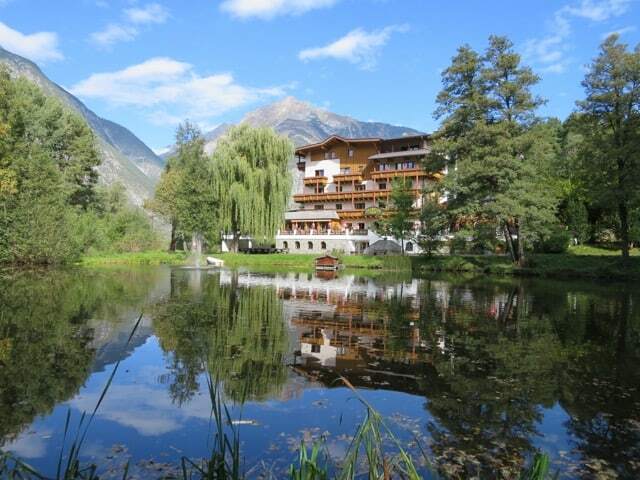 I can just feel the freshness of the air by that hotel by the lake and the soft scent of the wood indoors. Lovely stuff.